I made two versions of this recipe: One with traditional wheat flour, for a friend who wanted a reasonably easy, whole-grain, nut-free version of toddler fruit-and-cereal bars for his daughter; the other without wheat, for a nutrient-dense, protein-packed gluten-free breakfast or snack item L. could enjoy on busy days. While you can certainly tell the difference between the two versions in a side-by-side taste test, both are delicious and can stand on their own merits. You can also use other fillings if you’d prefer — we did a few with store-bought fig jam, which was wonderful, and raspberry jam would be another great, easy choice. 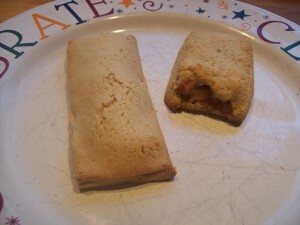 A traditional bar, on the left; and a gluten-free one (broken in half) on the right. Can you tell the difference? To prepare the dough, cream together the butter and honey until smooth. Add the eggs, beating to incorporate them fully. In a medium bowl, combine the salt, flour, and oats; add gradually to the wet ingredients, mixing just until the dough comes together. Press out into a disk on parchment paper; wrap and refrigerate for 30 minutes to 1 hour, until cold but not rock-hard. While the dough is chilling, prepare the filling: Combine all ingredients in a medium saucepan over medium heat. Allow to cook, stirring occasionally, for 15-20 minutes or until the apples have mostly broken down and the mixture is the consistency of very thick applesauce (it should be relatively dry, with no juices leaking from it). Allow the filling to cool somewhat before using. To assemble the bars, roll half of the dough out into a rectangle about 3-4 inches wide and 18 inches long, trimming the edges to square them. Carefully slice the rectangle in half lengthwise, creating two long strips of dough about 1 1/2 to 2 inches wide and 18 inches long. Cut each strip into six equal sections. Spoon a tablespoon of filling down the center of each of six of the rectangles. Cover with the remaining rectangles of dough and press the edges down gently to seal. Repeat with the remaining half of the dough, for a total of 1 dozen breakfast bars. Place the finished bars on a parchment-lined baking sheet and bake in a preheated 350 degree oven for 15-20 minutes, just until lightly golden brown and the bottoms are set. To prepare the dough, cream together the butter and honey until smooth. Add the eggs, beating to incorporate them fully. In a medium bowl, combine the salt, oats, and almond meal; add gradually to the wet ingredients, mixing just until a very soft dough comes together. Press gently out into a disk on parchment paper; wrap and refrigerate for 30 minutes to 1 hour, until cold but not rock-hard. To assemble the bars, gently roll half of the dough out into a rectangle about 3-4 inches wide and 18 inches long, trimming the edges to square them. (I recommend rolling this dough between two sheets of parchment, as it’s very, very soft and a bit challenging to work with). Carefully slice the rectangle in half lengthwise, creating two long strips of dough about 1 1/2 to 2 inches wide and 18 inches long. Cut each strip into six equal sections. Spoon a tablespoon of filling down the center of each of six of the rectangles. 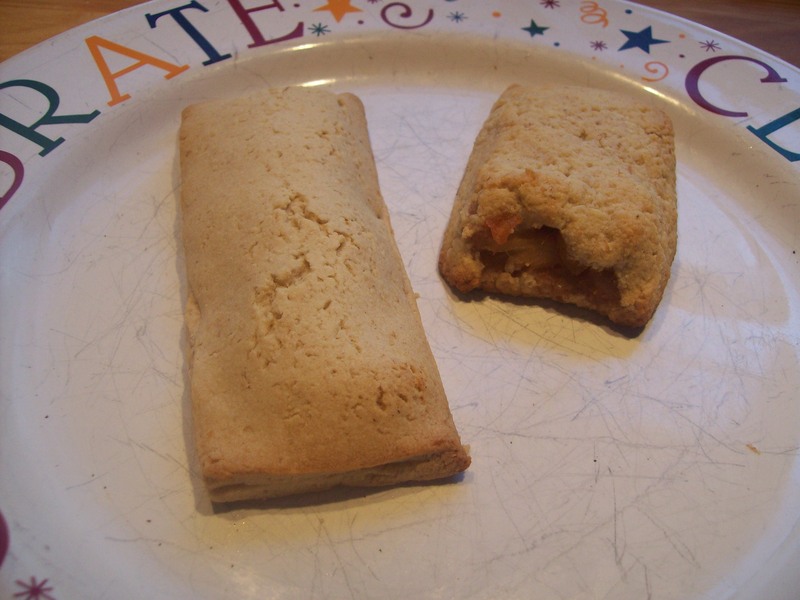 Cover with the remaining rectangles of dough and press the edges down gently to seal. Repeat with the remaining half of the dough, for a total of 1 dozen breakfast bars. Place the finished bars on a parchment-lined baking sheet and bake in a preheated 350 degree oven for 20-25 minutes, just until lightly golden brown and the bottoms are set. Allow the bars to cool completely before handling.